Camiguin never runs out of surprises. Yes, this beautiful volcanic island, lying off the north east coast of Mindanao, offers another extraordinary treat for tourists. Cold and hot spring waters are common, but a pool made of soda, that's rare. 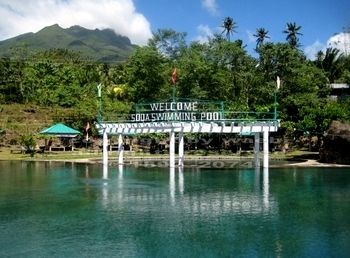 Lying beneath Mount Hibok-Hibok in Barangay Bura of Catarman town is the healing and whitening waters of the soda pool. This interesting pool tastes just like the commercialized bottled soda water minus the acidity. Its water source spouts up natural carbonated water, so rich that the continued flow of the spring water bubbles up to the surface of the pool. Take a dip in mineral water, with such lush vegetations around, while the majestic volcanoes watch over you is breathtaking. If milk baths are supposed to be good for the skin, bathing in soda, according to the local folks, is therapeutic. Cindy Hill, an awarded freelance writer said in one of her articles, that soda springs are quite rare, and that this mineral water rises from the earth naturally carbonated, forming warm pools. She quoted some studies that reveal that this nutrient-rich water provides critical habitat to rare plants and animals, but it is not restricted to wildlife alone. Scientists believe that soaking in the pools or better yet drinking it will reap the health benefits of natural soda water, which is known to reduce osteoporosis, decrease cardiovascular health disease, and lower blood pressure. The mineral content of soda spring water may vary from location to location. Meanwhile, Barangay Agoho in the municipality of Mambajao is using soda water in its water system. Before the pool in Bura was developed, visitors often dropped briefly in Agoho just to try its all-free soda bath. Camiguin from the sound of its name “come again” until now remains an exciting place to visit over and over again. It can take you to its virgin forests, highest peak, great dive sites, historical landmarks, as well as, must-try foods and delicacies only the island can offer.